The Progress Reports Module allows schools to create in depth reports on students' progress in each subject. These reports can then be shared electronically with parents and carers as well as staff. 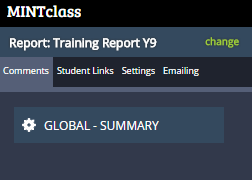 Log into MINTclass and click on the Progress Reports Module at the top of the screen. You now need to give the report a name and select the year group that the report is for. You also need to choose if the report will link to grades or competencies (you need to have purchased the Competencies module to us this option) then click on Create Report. Now locate the new report from the Choose an existing report list at the top of the screen and click on View Report. You will now see the setup area for the report on the sidebar. You will see that there are four main areas of focus for the report. We need to start with Settings. Within the settings area you will be able to map subjects, choose how data data is displayed, set grade types, create comparisons and comments. The first thing you need to do is select and map the Subjects that you wish to include in this report. Enter the Subject name as you wish it to be displayed in the report, now select the school subject name from the Actual Subject combo box. The next step is to choose the colour for the subject, this will be displayed on the front cover of the report, and then the icon for the subject. Finally you will need to choose the Grade type. You will need to know what type of data is stored in your school MIS to enable you to make the right decision here, your data or assessment manager should be able to help. Repeat the above steps for all subjects that you wish to include in the report, by clicking on the + New Row button located below the subject that you have just added. Note: Remember to click on Save Subject Maps from time to time and when you finish. The next step is to select the grades that you wish to include in the report and how you wish to display them. Tracker - This shows you the grade displayed on a scale to show the relation of this grade to another. Key - This allows you to display a word or words on the report for a grade or level held in your schools MIS, for example, 6 = Very Good, 3 = Below Average. Display - Simply displays the grade selected. Now you need to select the Grade Map. When you click on this combo box, you will see all the grades that your school has selected to be included, for example you may have Current Grade, Target Grade, Predicted Grade, Ability Level etc. Select the one that holds the information that you need to display. Finally choose a colour for this grade. Repeat these steps for all the grades that you wish to be displayed and then click on the Save Grade Maps button. If any of the Grade Settings you choose include the option of Key then you will need to map the Grades to the description here. Again, you will need a good understanding of the data kept in your schools MIS to enable you to utilise this area effectively. Type the Grade in the For column and the text that you wish to display on the report in the Replace column. For example, if you have a Grade 6 and you wish to display the text Above Average instead, type 6 in the For column and Above Average in the Replace column. You can now select a colour for this data and you add some text that will be displayed when you hover over the displayed text on the report by typing it in the Detail box. Repeat the previous steps for all the necessary grades and then click on Save Grade Maps. Comment Grade - This will allow you to allocate a comment to a grade within the selected grade set. Comment Grade Type - Select the type of data held, for example Numeric or Alpha Numeric. Boundaries - Leave this set to Don't show Boundaries. Select the appropriate information from each combo box and click on the Save Subject Maps button. Note: If you select any comments you can create them in the next section. Once you have completed this setup section and are ready to run the report, you will need to click on the Grade Pull button to pull the data from MINTclass. Important: Each time you click on the Grade Pull button, it will import the latest data. Therefore it is strongly advised that once the reports go out, you DO NOT click on this button again. As previously mentioned, you can create a standard set of comments for each subject that link to a particular grade. For example, if a student has a grade 5 in Maths, you can create a comment that will be automatically displayed if you have selected Comment Grade and Comment Grade Type from the Misc section. Click on the Comments tab on the side bar and then click on the subject that you wish to add comments for. You can type the information into these boxes or simply copy and paste from another document or comment bank. Once completed, click on the Save Comments button at the bottom of the screen. Repeat these steps for all Subjects. Once you have all the data mapped and the comments have been entered, you are ready to view your report. Go to the settings tab and scroll to the bottom of the screen and click on the Pull Grades button. Now click on the Student Links tab and click on a Student to view the front page. Each of the subjects that you added within the settings area are displayed on the left hand side of the screen. Click on a subject to view the subject specific information. Once you have created your report and checked the, you can email the parents of your students from within Progress Reports and send them a link to their child's report. Select the Emailing Tab from the sidebar. Firstly you will need to create a list if email addresses manually unless you have these in your school MIS and can export them into a CSV file, which in turn you can import into here. If you intend to import the data then you must have the following information: Student Admission Number, Parent Name and Parent Email (where parent is the person whom you wish to allow access to the report). Click on the Choose File button and browse to the file that contains the necessary information. Click on Upload File. You now need to set up an email template that you wish to send to parents. Click on Edit Templates and then enter a name for your new template and click on the Add Template button. The next step is to construct your email template. Select the template from the Choose Template combo box and a text box will appear towards the bottom of the screen. You have a number of Tags (merge fields) that you can use displayed in the blue box, just type them into the email text box exactly as shown. Once complete, click on the Save Template button. Once you have created the Progress Report, have a list of parents' names, email address' and have an email template, you are ready to send the email to the parents, which will allow them access to their child's report via a web link. Click on the Send Email/View Emails button on the side bar. You can create email runs or send a single email if necessary. Give the email run a name, this will allow you to search for this run at a later date, then choose the email template that you wish to associate with the run and click on Setup Email Run. You are now ready to send the emails to all the recipients created at the Email Setup stage. Click on the View Detail Below button located in the Email Runs section. To send the email to all those included in the email run, click on the Send Emails button. This will send an email to the parents with a link which when they click on the link, they will be asked for a password (included in the email) once they log in they can see the report.